Shepton Mallet Snowdrop Festival is fast approaching 16 & 17 February. There will be specialist snowdrop stalls: Avon Bulbs & Triffids Nursery on both days. A lecture on Galanthophiles Sunday 3pm and a Gardener’s Question Time panel on Sunday 11am- 12 featuring 4 local horticulturists on the panel: Mickey Little from Avon Bulbs, Chris Inchley from Kilver Court, Christo Nicole from Wyld Wood Garden Services and designer Angela Morley. 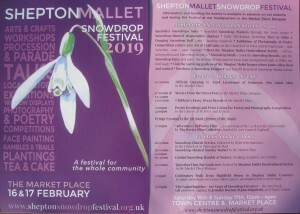 Questions can be emailed in advance (admin@sheptonsnowdropfestival.org.uk) or taken from the floor.